Bollywood actor Bipasha Basu, who has been away from the silver screen from a quite some time now, never misses grabbing eyeballs on social media. Her Instagram account is a treat to her fans as she keeps uploading her bold and beautiful pictures. 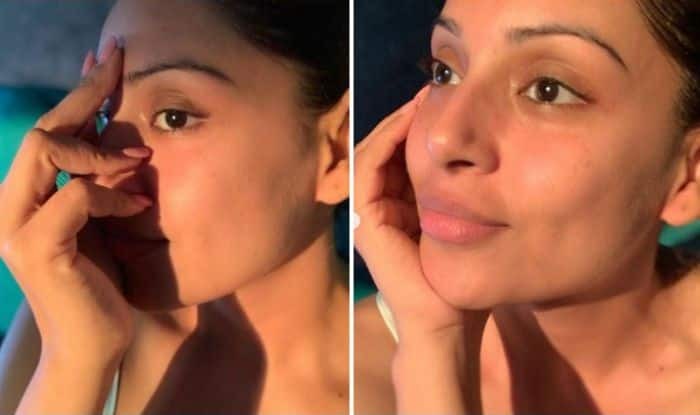 Earlier today, she took to photo-sharing app to share her no make-up selfies and it will make you fall in love with her all over again. In some of the pictures, she can be seen posing with a hand on her face while in others the wide smile on her face makes her look beautiful. Earlier, she has shared a couple of pictures from a family function where she posed with husband Karan Singh Grover and her sisters. In the pictures, Bipasha can be seen donning a gorgeous heavy embellishment pink saree teamed up with a garland on her stylish hair bun. She accessorised her look with bindi, minimal makeup and subtle makeup. On the professional front, Bipasha will be next seen in the thriller film titled Aadat opposite Karan Singh Grover. The film is produced by Mika Singh and is directed by Bhushan Patel. The film has been written by Vikram Bhatt. It also features Miss India Natasha Suri and Bigg Boss fame Sonali Raut in important roles.